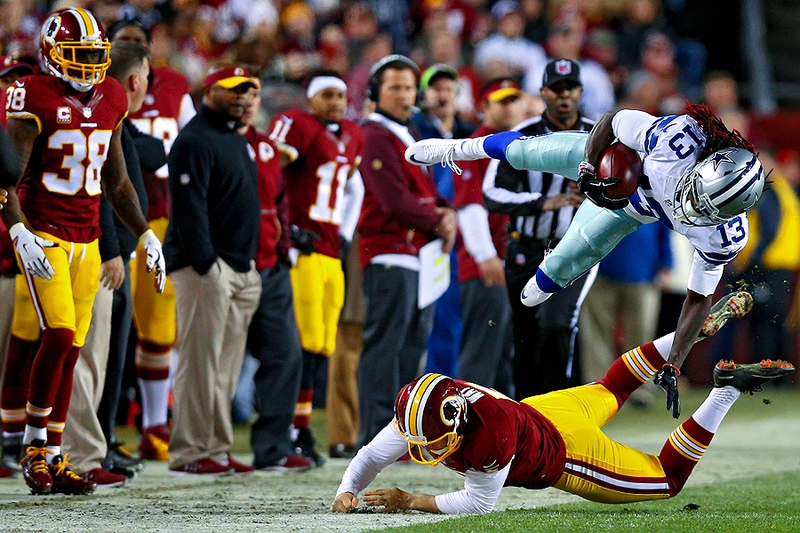 "Lucky Whitehead #13 of the Dallas Cowboys is knocked out of bounds by punter Tress Way #5 of the Washington Redskins during a kick return in the first quarter at FedExField on December 7, 2015 in Landover, Maryland." Some games start slow and others begin fast- yet neither are perfect in the mind of the photographer. If a game starts slow, you hit the shutter a lot hoping to have compelling images before halftime. If the game begins with big plays, you hope the mayhem continues so that the great pictures keep unfolding in front of you. But nothing is ever scripted in sports - one can never predict the flow or intensity of the game. As the Dallas Cowboys played the Washington Redskins last week, a couple big plays started the game - but scoring was left up to the kickers. Photographers were continually waiting for the big touchdown to determine a winner. Yet the real sea-saw battle of scoring in the end zone didn't happen until late in the fourth quarter. In the end, the game driven by field goals, ended on a field goal, proving that no two games are ever alike.